I get back as much as they give, and more! Walking as a Volunteer with Achilles Canada makes you a better person. 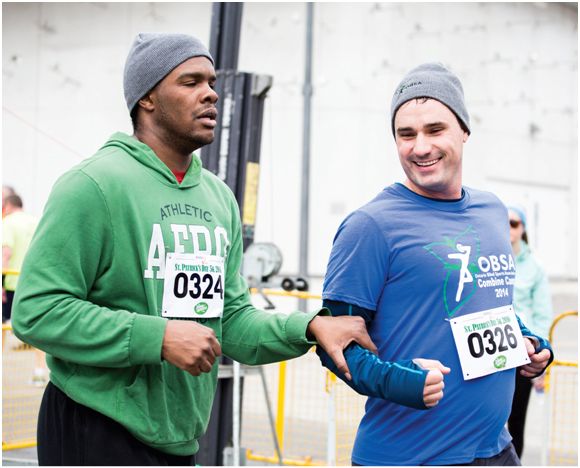 The first time I ran with a visually impaired athlete during a training run in mid-town Toronto, I was able to tell my athlete about the areas we were running by. The birds and the scenery. I had the vision but missed what he heard by running with me. I have since learned to take better notice of the beauty in everyday life. We learn that you can accomplish whatever you want, there are only abilities no disabilities in life, you just have to take advantage of them. To become an Achilles volunteer you must complete a volunteer application form or download a pdf of the paper form and mail it to us. Want to Know More About How You Can Help? To learn more about what committees are available and how you might fit in click here!